Memories of the Holocaust are as fresh as they were decades ago for the women who were forced into World War II concentration camps as children and miraculously lived to tell the tale as adults. 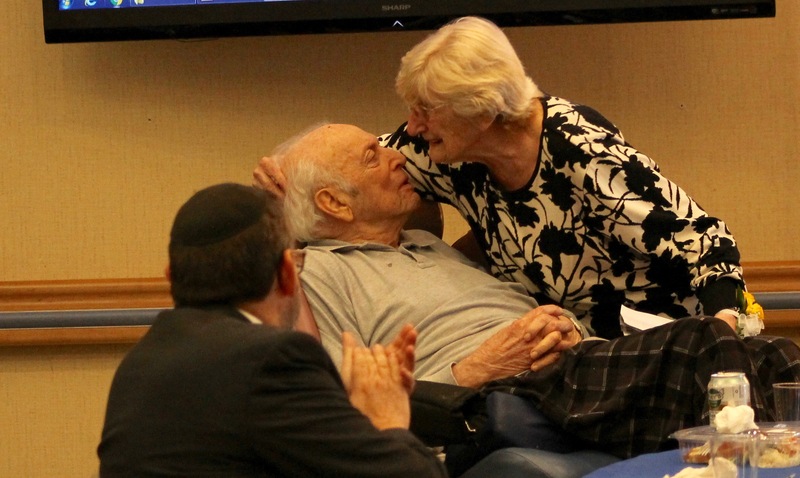 Parker Jewish Institute hosted “Stories of Strength: a Holocaust Remembrance” Thursday afternoon to document the stories of three survivors. 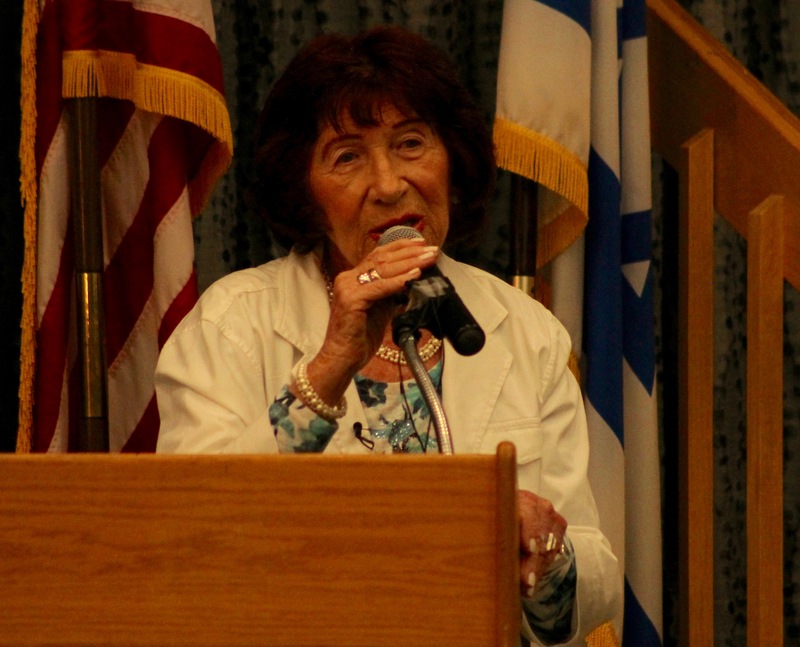 Chana Pfeifen, Alice Tenenbaum and Mia Feuer, wife of survivor Samuel Feuer, shared memories with a heartbroken audience as they recounted tales of gas chambers, death marches and the traumatic loss of their parents at the hands of the guards and doctors who imprisoned them. Lilach opened the forum with a presentation focused around what can be learned from the Holocaust and how many times history could have gone differently with earlier help from countries around the world. Tenenbaum was a young teenager when she was forced into a ghetto before being taken to Auschwitz-Birkenau concentration camp where an estimated 1.1 million people were killed before the Soviet Union liberated the prisoners in January 1945. Dr. Josef Mengele, known as the Angel of Death for his role in sending prisoners to gas chambers and performing inhumane experiments on people, frequented the camp and tried his hardest to execute 14-year-old Tenenbaum, but an unlikely savior appeared. Grese was among the 45 people accused of war crimes at the Bergen Trial in 1945 and was executed for her actions later that year. Without access to a clock, prisoners never knew what time it was or what day it was after a few weeks in the 1,000-man barracks. Tenenbaum said the daily routine revolved around a strict schedule, including the repetitive counting of prisoners for hours in the morning before the once-daily bathroom break given in a large room filled with holes in the ground. “They told us when we arrived if we took our clothes and hung them on a hook, remember the number of the hook because we’ll come back to it,” she said. “Of course, you never saw your clothes again. My parents shoved all kinds of gems and jewelry into the shoulder pads, they hid American currency in the belt. As soldiers began to fear the camps would be invaded nearing the end of the war, prisoners were moved from camp to camp. Tenenbaum, her mother and her sisters were sent on a 40,000-man death march to Berlin that only approximately 6,000 people survived due to harsh conditions on the prisoners’ already deteriorating bodies. 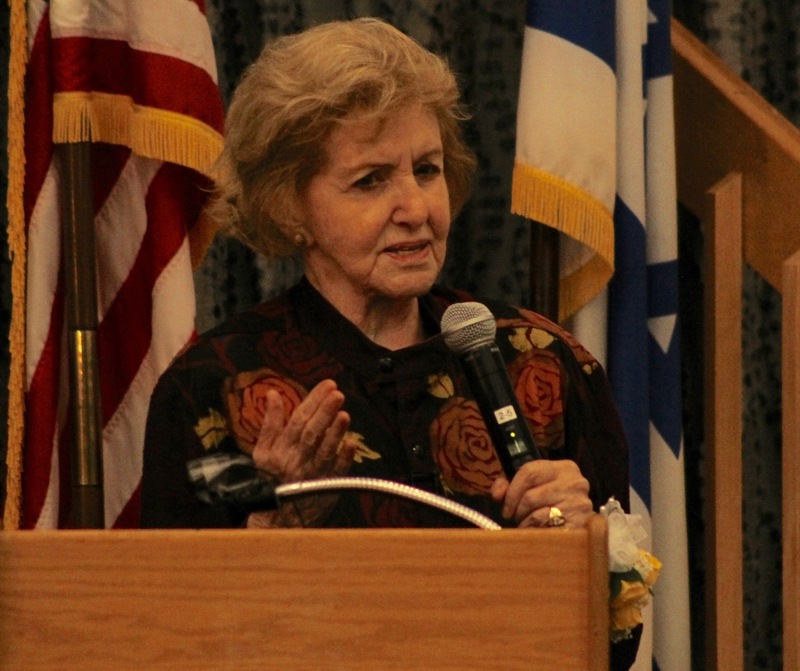 After the march, she was moved to the Bergen-Belsen camp. Tenenbaum said this alone felt like a brief spell of liberation because she no longer had to fear the looming gas chambers of Auschwitz. When the British troops liberated the camp in April 1945, Tenenbaum took refuge in Sweden, where she was very well taken care of and sent to a private school. Not long before her 18th birthday, she met her future husband at a college dance and managed a normal life after a tragic childhood. Pfeifen was 8 years old when her parents and 4-year-old sister were taken from their home without warning. Her family and hundreds more were marched through the Ukranian streets and separated from their loved ones. The men were stripped, tortured and killed almost immediately, Pfeifer said, and their bodies thrown into a mass grave. “They told us some of the men were still alive,” she said. Pfeifer and her family took another death march to the Dniester River before being imprisoned in Transnistria, a horrific ghetto-camp hybrid, by the Romanians. They were given no clothes, shoes, or food and have to scavenge for whatever scraps they could find. Pfeifer recalled a story when her mother brought her a frozen potato. After her liberation, she attempted to sneak into Palestine but was caught by the British soldiers and sent to an internment camp in Cyprus for Jews trying to illegally cross the border. When she was finally freed from Cyprus, she returned to Palestine and joined the army to fight in the war for independence. 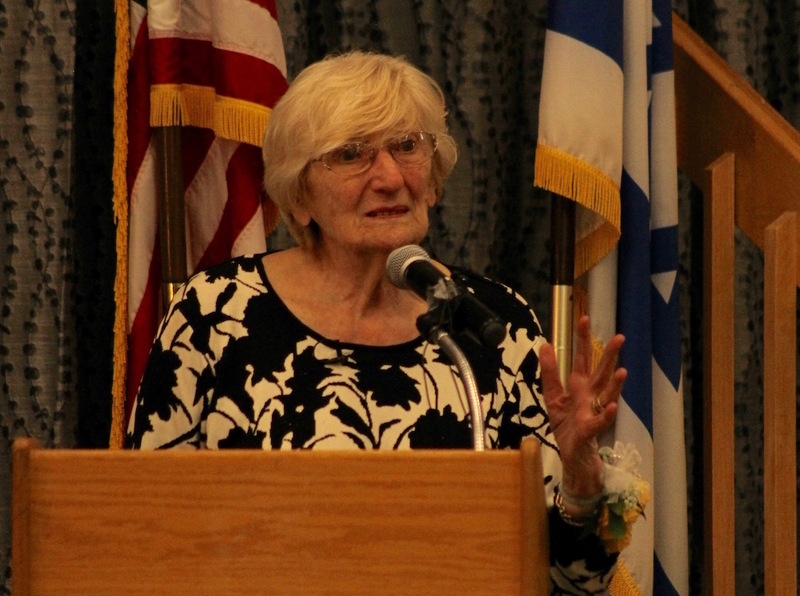 Pfeifer told her two sons about her experiences once they were old enough, and she believes the story alone impacted her boys as well as a generation of Jews. Mia spoke on behalf of her husband, recounting the stories of his experiences during the war he’s told over their many years of marriage. Samuel was also 14 when his parents and two sisters were taken to Auschwitz in late May of 1944. The soldiers separated the family immediately after arrival and “said they would meet again and shouldn’t worry.” A few days later, Samuel learned his parents had been burned to death and was told to remember “the smoke from the chimney on June 2” as part of their final moments. Despite all of the horrific things Samuel saw and experienced in the most infamous concentration camp of World War II, Mia said he didn’t let the past affect his future.